And that’s why I had to finish my comic this morning! I’m watching I need Romance 3 at the moment and I’m enjoying it so much. Especially after the terrible kissing in The Heirs! So nice to watch a drama with real kissing instead of the standing still with eyes wide open…..ugh… hate that so much. It is really hard to pick winners! So hard that I made Sophie do it… haha. We also chose 2 winners because the giveaway was so popular. Can those people please send me an email at [email protected] please. 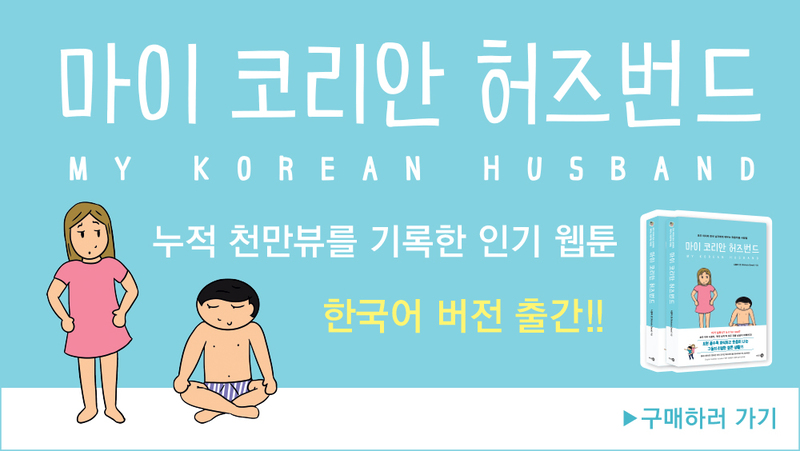 There is now a My Korean Husband Bonus YouTube Channel! So this somewhere where we can post more random videos and vlogs. The first video is Mr Gwon trying some Kit Kats. So make sure you subscribe so that you don’t miss those videos. At least I made them laugh! This is a new type of video we will be doing. All in Korean! While it’s aimed at Koreans, there will be subtitles for English speakers. Why did it take so long for Mr Gwon to do a video in all Korean? Well like he said in the video, it’s actually hard to come back to speaking Korean all the time and he often forgets words. Not only that, but Korea doesn’t really have a big YouTuber community and there aren’t that many Koreans doing videos like other countries because there can be a lot of judgement about it. My husband had to break through those fears in order to do this video. While he has become comfortable speaking English on camera…. Korean is another story. The other announcement we have is that we have a new video schedule! Monday: There will be a “Commenting on Comments” video where we will talk about some of your comments (and maybe open some fan mail). Wednesday: This will be the day for “Mr Gwon Time”. Friday: The video on Friday will always be an “Ask Video” so it could be “Ask Korean Guys”, “Ask the wives of Korean guys”, “Ask GD” or Mr Gwon and I might answer some questions. There will be videos on other days as well but those ones won’t have a set day. So we will be making at least 3 videos a week for you guys. We also have a bonus channel where we will be putting up some random stuff very soon. So on the weekend we got the chance to hang out with Hallyu Back and we made a video together! Who do you think won? Tell us in the comment section! Also the check out the video Steph and I made where we play a Charades Challenge Koraen Drama Style! I have not played a game like that in a long long time…. I am terrible! Make sure you go vote who you think won and check out their YouTube Channel. Steph and I also did a livechat on the weekend together as well, about Asian dramas!